Why is Wood so Good? We have used wood since before records began. 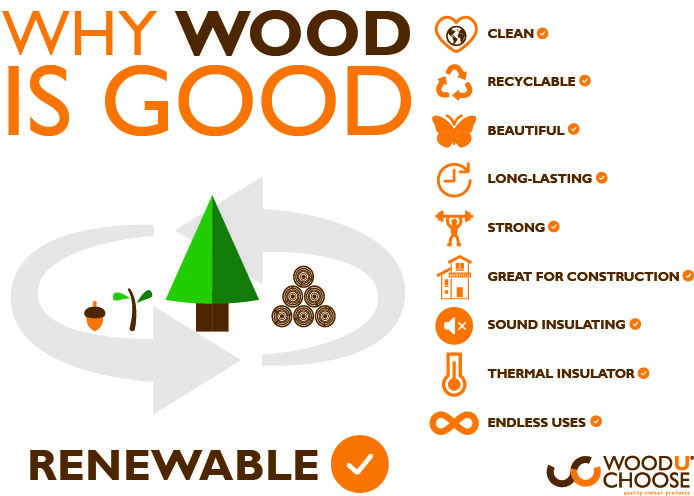 From tools to cutlery, furniture to buildings, wood is our only renewable natural resource. Our use of wood has continued to increase over the last 50 years and has accelerated further as we face two major issues; climate change and a soaring world population. To construct adequate housing, for future generations, we seek sustainable construction methods with the minimum effect on the environment. With continuing scientific developments in the use of wood and how it can be adapted to suit our needs, plus the growing awareness and investment into manageable forestry, this ensures that wood continues to be the overwhelming choice of customers who seek a reliable, environmentally friendly, attractive material at good value. Wood is renewable and sustainable and costs less to produce than steel and concrete - the primary building materials of the last 125 years. Wood is environmentally responsible because it stores carbon, whereas the production of man-made materials requires huge amounts of fossil fuels and produces harmful emissions. Pound for pound, wood is as strong as steel and extremely durable. Wood has great acoustic and thermal properties. Exciting new technologies are enabling the construction of tall, modern wood buildings that are safer and cheaper to build. Wood’s diversity, beauty and connection to nature means that its uses in modern society can be both practical and aesthetically admired. Protected and maintained wood will last for hundreds of years and can be repaired, re-finished, adapted and recycled throughout its life in service. The benefits of wood do not end with its practical applications – once it is finished with, it is 100% biodegradable and can be used as a fuel. The waste from processing and production is also re-useable as a fuel or as animal bedding (wood shavings and sawdust) plus many more uses. Reduction in waste to landfill is also hugely advantageous – as our waste problem grows internationally. The uses for wood are endless…. This is all great news and suggests that the more wood we use the better – which is true but caution is needed. Irresponsible forestry practices and the exploitation of a number of species have led to many timbers becoming endangered, some critically. Organisations such as CITES https://www.cites.org/eng, IUCN - The Red List of Endangered Species http://www.iucnredlist.org/ list the species that are at risk. It is therefore vital that the efforts of forestry protection organisations and timber certification programs such as FSC http://www.fsc-uk.org/ and PEFC http://www.pefc.co.uk/ continue to work with all in the supply chain to ensure that we manage the resource responsibly. *Recent studies have found that, with the tightening of legislation and an international commitment to manage our forests responsibly, improvements have been made. Significantly some regions of North America, Canada, Europe and Russia have seen encouraging signs of recovery and growth of forest areas but there are still 13 million hectares of tropical forests disappearing each year, 96% of deforestation occurs in tropical regions. Many of these areas are in developing countries where their sought after tropical timbers are an extremely valuable commodity – illegal logging and trade are still rife here. Countries within the vast area of the Congo Basin have been facing challenges as there are significant threats to their forests and the communities that rely on them. The demand for the wood that is under threat (and is being forested illegally) is the cause of these difficulties and therefore; education is key to ensure consumers are aware of how our wood is obtained - giving them an informed choice when it comes to choosing timber species. Learning which wood is best for which application is also essential to get the most out of this natural resource. Location, exposure, durability, workability, structural performance, appearance, dimensional changes and finishing all have to be carefully considered when sourcing the right wood. By approaching wood procurement from an informed, educated and responsible, position we can continue to see many benefits, both individually and globally. The resurgence of wood and our reliance on this beautiful and diverse material suggests that it is a sustainable long term solution, this is, however, subject to how we all look after it. Take a look at our own approach to: Sustainability and the Environment.